The Acadia Axemen could get used to this streak. On the heels of a commanding 74-55 victory over the Saint Mary’s Huskies, Acadia will play in their third consecutive AUS championship game Mar. 3 at 2 p.m. The Axemen will hope to borrow from last year’s championship team which dismantled top-ranked St. Francis Xavier when they meet another top seed, the Cape Breton Capers, in the 2013 title match. Acadia’s Tyler Scott is eager for another contest between the conference’s two finest. 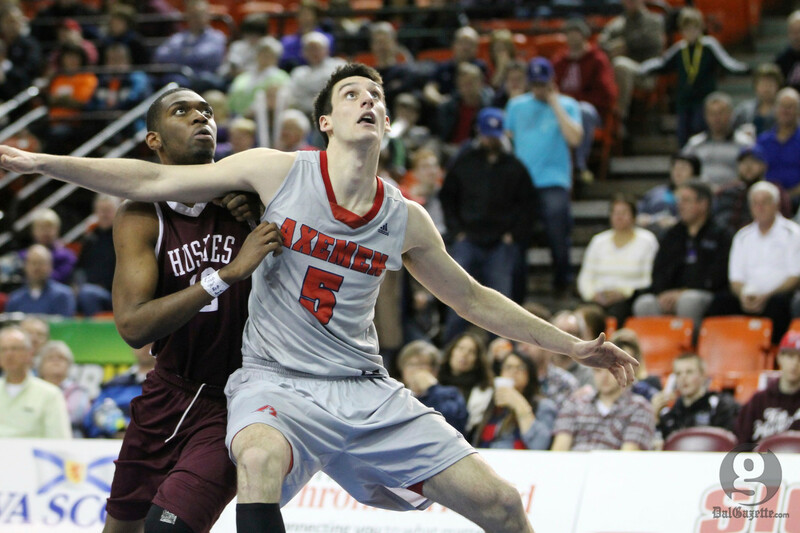 Scott collected 19 points and six boards for Acadia in a match where the Axemen’s depth pushed the game out of reach. Unlike the balanced scoring Acadia displayed, Saint Mary’s was left to rely on Riley Halpin in the third quarter, recording 11 of his team’s 16 points. But when Halpin went on a cold streak, his Huskies deteriorated. After the last of Halpin’s three baskets from behind the arc in the third quarter, Acadia went on a 13-2 tear, creating a gap too large for the Huskies to surmount and effectively ending their season. Coach Jonah Taussig and his 6-14 Huskies lost this match by almost 20 points, a similar margin to their two previous outings against 15-5 Acadia this season. “Full credit to them, they are the better team,” says Taussig. “They proved that in all our meetings this year. On Saint Mary’s side, Halpin’s 21 points and eight boards was joined by 10 points from Harry Ezenibe and Jeremy McAvoy contributed nine boards. CIS No. 2 ranked Cape Breton will not be an easy opponent for Acadia, the country’s fifth best team, but the Axemen are the only outfit to have solved the Jimmy Dorsey-led squad in the regular season. The February loss ended Cape Breton’s undefeated streak at 16. Whatever happens in the championship, the losing team is expected to receive the sole wildcard berth at CIS nationals, joining the AUS champion who automatically qualifies. For the last two seasons, both opponents in the league final received spots since the conference hosted the event. Acadia’s Owen Klassen, who contributed 13 points in the victory, says a potential wildcard berth is not what he’s focused on–he wants to earn his spot.